My forthcoming monograph, Celtic Myth in Contemporary Children’s Fantasy, examines a number of ‘Celtic’-inspired works of fantasy literature, including Henry Neff’s The Tapestry. The Tapestry is a series of five fantasy novels that create an alternative world of ambitions scope, and center around Max MacDaniels, a modern incarnation of the Irish hero Cúchulain (see my previous blog post for an overview). Henry Neff has just launched a spin-off series, Impyrium (HarperCollins) which is set in the same fantasy world, but many years in the future. Dimitra: Why the centrality of Irish mythology in the series? I am aware that you have already answered this question on your website and in video podcasts, but my book is specifically focused on the use of Celtic myth in children’s fantasy, so I hope you will forgive me if I feel compelled to ask this question too. To put it in context: the series obviously borrows and creatively reshapes elements from a number of mythological traditions (Greek and Roman, Old Norse, Finnish, Hebrew, Egyptian, etc.) but it cannot be denied that Irish mythology is central amongst them. Max and David are descendants of Irish divinities, Solas was built in Ireland by the Tuatha Dé Danaan, and a number of central characters from Irish medieval literature (Lugh, Scathach, the Fomorian, the Morrígan, etc.) appear. Is there a rationale for this in terms of the internal history of your secondary world? It is obvious, for example, that Old Magic is not restricted to things Irish – dragons are of the Old Magic, and so is Mina, the Ormenheid, Ymir (and the power in Tartarus? ), and presumably the blade of Set. Why is it that our two central characters derive their Old Magic from Irish myth? One may speculate, for example, that the other schools of magic that fell before Solas were founded by ‘stewards’/divinities from other mythologies – was it just a ‘historical accident’ that it was Solas that fell last and managed to evacuate refugees to the New World? Or is it that Irish Old Magic is inherently more powerful than that from other sources? Alternatively (or, in addition), is there an external rational? Do you see Irish myth as part of your (and your family’s) heritage, for example, or perhaps a visit to Ireland (and its stunning archaeology) revived your childhood fascination with Irish medieval sources? Henry: The emphasis placed on Irish mythology in The Tapestry has more to do with choosing a theme and flavour to the story than suggesting a hierarchy among various mythological traditions. When I came across some Celtic stories as a boy, they possessed both a beauty and ferocity that I found wildly compelling. It’s sad to say, but mythology is exotic fare in American public education. The little that’s taught is often limited to Greek/Roman or a smattering of Norse or Egyptian. While I wanted to include these (and others) in The Tapestry, I made a conscious decision to place Celtic mythology at the forefront. The material not only inspired me, I knew that many readers would be hearing about Cúchulain and the Cattle Raid of Cooley for the first time. I’ve received many emails and letters from readers asking for book recommendations to learn more about Irish mythology, and that’s been very gratifying. 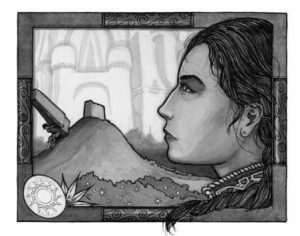 Why Solas (the fallen school) happened to be the preeminent school of magic and, ultimately, the literal and figurative seed for Rowan is due to several factors. The first was that Ireland made sense as a location for a school of magic — it was close to Europe and major cosmopolitan centres, and yet it’s also physically removed and has its own history, politics, and language. Magic and a notion of otherness play a strong role in the country’s traditions and folklore, and, of course, you have all the wonderful history of the Tuatha Dé Danaan, the Fomorians, and the Sidh. Much has been written about the role Irish monks played in preserving manuscripts and knowledge during the Dark Ages and, to my mind, that notion strengthened the idea that Ireland was not only a picturesque setting for a magical school but also a logical one. It made good sense to me that it would have become a repository of knowledge (magical and mundane) and that magical scholars might have sought refuge there. A third reason is that Elias Bram was Solas’s Archmage and events during his seventeenth century childhood drive many of the events that unfold during The Tapestry. He was the greatest sorcerer of his age and a troubled soul who had personal history with our arch-villain, Astaroth. It was fitting that Bram’s school, Solas, and its successor, Rowan, would be central to their struggle. Was this because Solas and Rowan have ties to Irish lore? No – that’s simply the way I built the world and events played out. Of course, this presumes that Rowan even is the preeminent school of magic. As we learn in the final book (The Red Winter), Rowan is not the only school that exists. When Max McDaniels visits Arcanum, we discover that human beings are not the only ones building universities and studying magic. Could there be others throughout the world, schools that kept a lower profile than Rowan, or managed to stay off the radar entirely? I couldn’t say, but I would assume so — particularly in places with large populations and early evidence of human activity: China, India, the Middle East, Central and South America…. I think J.K. Rowling is delving into such things as I type. One challenge when writing a series like The Tapestry is that there are so many intriguing possibilities you’d like to explore but cannot due to the fact that you’re trying to tell one story and not twenty. Were there other heroes that struggled against Astaroth, other magical schools that fought, hid, or negotiated truces? It’s not only possible, but probable. I’ll never forget studying those wonderful maps of Middle Earth and wondering what other peoples were doing during the War of the Ring. Were there any Haradrim that fought against Sauron? Maybe there was an Easterling hero working diligently to overthrow Sauron (with help from those mysterious “Blue Wizards” that Tolkien alluded to but never fleshed out). A rich world offers endless possibilities and it’s both fun and a little cruel that an author can never explore them all. As far as an external rationale is concerned, there isn’t one aside from a personal affinity for Irish myth and folklore. While my wife’s ancestry is predominately Irish, my roots are German, English, and Scottish. I’m merely an admirer. Dimitra: Thinking about Max McDaniels in particular: is there an implication that his “human” family also has an Irish/Celtic heritage? I was also wondering about Connor Lynch – for a while I thought that Connor may end up being one of the protagonists, given that he is Irish and links to Irish mythology were signalled right from the beginning of the first book. Was that link intentional to – so to speak – throw the reader off the scent of the main second hero, David? Henry: For Max and his family, these associations were intentional. Using Irish names and surnames helped not only to underscore his ties to Cúchulain and Celtic mythology, but he also grew up in Chicago, which is home to many people of Irish-American descent. At one point, I toyed with delving more into his mother’s history as Deirdre Fallow and why Lugh chose her to be the “vessel” for his son, but it fell too far outside the story’s scope. David Menlo’s name was chosen solely for its associations with Thomas Edison and the “Wizard of Menlo Park.” I wish I could claim a more clever or layered series of inspirations, but that’s all that lies behind it. As for Connor, I had originally wanted a larger role for him but ultimately decided to focus more on Max and David (two children of the Old Magic). If I’d approached The Tapestry like a typical boarding school story, I’m sure Connor would have played a larger part. Unfortunately for Mr Lynch, the action shifts away from Rowan in the second book and there simply wasn’t a compelling reason for him to accompany with Max and David. That became Cooper and Hazel’s role, and it made more sense for an agent and a mystic to fill those roles as the group raced across Europe. While Mum tagged along, poor Connor was struck back at Rowan with Mr Sikes taking gradual possession of him. That Connor was Irish had less to do with the book’s mythology and more with the fact that Rowan was an international school with students from all over. I needed a big personality and happened to be teaching an Irish student who was outspoken and funny in a way that was extremely engaging and refreshingly un-American. His name (fittingly enough) was Lughan and there’s a bit of him in Connor. Dimitra: Was it a conscious decision to use the Celtic/pagan festivals in pivotal moments of the series? In The Hound of Rowan we first see Max using body amplification and starting to be conscious of his abilities on All Hallows Eve (for which you do use the term ‘Samhain’ in later books). In The Second Siege Max and David fly aboard the Kestrel to the Sidh on Christmas Eve, the pagan Yule. In The Fiend the Forge Max and David attack Astaroth on Walpurgisnacht, the eve of Beltaine. In The Red Winter Astaroth attempts to open a portal on Imbolc, while Max finally departs for the Sidh on Midsummer (part of me was expecting this to happen on 1 August to coincide with Lughnasadh). Clearly, these are also the liminal times during which the Sidh communicate with the human world in the Irish tradition. How conscious were these choices and how do you see them as part of your world building? Henry: Yes, it was. Liminal times of the day and year have particular significance in many different stories and cultures. They lack fixed definition and thus a greater range of possibilities exists — possibilities that often violate or stretch our notions of reality. That’s not only a fun and wondrous thing to think about, it also has a logic I find appealing. Of course, a spell cast at the height of the winter solstice is going to pack more punch than one cast on any old Tuesday. That’s just common sense! It’s no accident that major events in The Tapestry – particularly those involving travel between worlds — occur at such times. Aside from having a link to various mythologies, it’s a useful device for telling stories that incorporate magic. For writers, magic can create twice as many problems as it purports to solve. If you don’t impose rules and limits, you’re going to be drowning in plot holes. By restricting certain possibilities to particular times, I saved myself some headaches while enhancing the narrative’s structure and adding some urgency. For example, Astaroth could only open a way to the Starving Gods on a special day like Imbolc. If he’d been able to do so at any given moment, it would have been virtually impossible for anyone to stop him. As far as Max’s departure date is concerned, I chose Midsummer because it’s an occasion that is commonly associated with faeries and magic. In retrospect, Lughnasadh — although less well known — would have been particularly fitting for the son of Lugh Lámhfhada. Where were you when I was writing that scene? Dimitra: Are the faeries in the Isle of Man and Ireland a representation of the fairies/sidh of modern Irish folklore? Or are there just elemental spirits of nature? In The Hound of Rowan the faeries are referred to as ‘echoes of Old Magic’. Are they the remnants of the ‘stewards’ and other spirits still left in this world? Is that why they are keen to get to the Sidh and take up the Morrigan’s offer? This is a convenient place to also mention the Fomorian. Do you see him as a representation of the magic of ‘wild’ nature? (he is likened to a storm, a rock, etc.) He lives in the real world (rather than in the parallel world of the Sidh) and his location and some of his actions remind me of representations of Manannán mac Lir. Is he a leftover of Old Magic in nature, like the fairies? Their eagerness to go to the Sidh is driven by two factors. The first is that our world has been in a state of chaos, and that Astaroth has not created the utopia he promised. We don’t know precisely why the faeries on Man have taken refuge with the Fomorian, but we can infer that something dangerous — a demon, perhaps even Yuga — has driven them there. Despite the Fomorian’s protection, Man has literally been an island under siege. The Sidh not only offers the faeries a more peaceful environment, the realm is sacred to them. I think of it as being fundamentally more attuned to a faerie’s nature —a place where they can be their truest selves. In this way, it’s not unlike Eden, or the Undying Lands in Tolkien’s mythology. It’s not surprising that many faeries were eager to take up the Morrígan’s offer. As for the Fomorian, I do regard him as a living manifestation of the wilder, more primal world. He is an anachronism, out of step with the modern age yet never welcomed by his ancient peers, the Tuatha Dé Danaan or the Fomorians. His role in the books even straddles those two groups — he is both helpful and a little terrifying. The aid he provides is not spurred by any love for mankind but simply his view that Astaroth and Prusias pose even greater dangers. Regarding his history, I had fun exploring that in the third book when he challenges David Menlo to guess his name. While researching the Fomorians, I found it interesting that their physical appearance could vary so widely – they were a literal grab bag of creature, animal, and human parts. Some Fomorians, such as Balor, were hideous while others were indistinguishable from the upstart Tuatha Dé Danaan. I was drawn to the idea that the most beautiful of the Fomorians — Elathan — would father a deformed child and refuse to claim him. There are parallels with the Greek god, Hephaestus. Both are rejected for their appearance and are skilled blacksmiths, but I wanted the Fomorian’s isolation to be even more pronounced. After all, his father didn’t even give him a name to anchor his place in the world. Ultimately, it’s David Menlo who makes good on his promise and uses the Book of Thoth to give the giant a truename. For me, that was one of the most touching moments in the series. But, yes, the Fomorian plays the role of “Nature” and it’s no accident that his final battle was fought against the dreadnoughts — abominations that symbolized the worst of human science. Dimitra: What sources on Celtic myth did you consult during your research for the series? You’ve referred to Kinsella’s translation of The Táin and Lady Gregory’s Cuchulain of Muirthemne as your sources for the Irish material. Any other specific books on ‘Celtic’ mythology that proved to be important while researching for the series? My bet at the moment is on Celtic myth & legend, poetry & romance by Charles Squire (I may be completely wrong! ), but perhaps you also consulted Celtic Heritage, by Alwyn and Brinley Rees; or Proinsias Mac Cana’s Celtic Mythology; or one of Miranda Aldhouse-Green’s books? This is a long shot, but could I also ask whether you read Robert Graves’s The White Goddess? Henry: I consulted a number of sources, but the mainstays were Kinsella, Lady Gregory, and Squire (good guess!). I regret to say I haven’t read The White Goddess. It’s a tricky exercise incorporating old tales and mythology into a new story. While I wanted to be respectful of myths and the cultures they represent, I didn’t want to be hag-ridden (I couldn’t resist) by every little detail. A fascinating – and head-spinning – aspect of Celtic mythology is the multiple, and sometimes conflicting, versions of some stories. Was the gae-bolga a barbed spear? Or was it simply a fighting technique? I’ve heard it described both ways. Ultimately, I made peace with the fact that I wasn’t attempting a scholarly work on Irish mythology; I was creating a work of fiction that utilized some elements from its stories. My goal shifted from trying to get every detail “correct” to adapting the myths to fit my story while staying true to their basic essence. Creatively, this was the right decision and one that afforded me the freedom to make The Tapestry the story I wished to tell. Scáthach is a good example of where I took some creative license but hopefully didn’t compromise the character. Mythological Scáthach is not only a trainer of legendary warriors; she’s also a mother whose daughter, Uathach, becomes “involved” with a rather brutish Cúchulain. My version is also a great fighter and trainer of warriors, but I altered the character to make her love story with Max more compelling and believable. The Tapestry’s Scáthach is considerably younger than the mythological version and wary of men, having trained many heroes who tried (and failed) to make their way into her bed and then made boastful lies about their “conquest.” In this sense, Scáthach possesses some qualities similar to the Greek goddess Artemis — the beautiful and independent warrior/huntress. And there are other mythological concepts at play. In The Tapestry, Scáthach was a mortal woman who died two thousand years ago but was granted immortality in recognition of her deeds and feats. This recalls the einherjar of Norse mythology: spirits of great warriors handpicked by the Valkyries to serve in Valhalla and fight alongside the gods when Ragnarök fell. Given all this, it’s safe to say my Scáthach differs considerably from the versions you’ll find in Kinsella or Lady Gregory, but I hope the character’s essence is faithful to the source. That was my goal, in any case. If you haven’t read The Tapestry yet, I hope this interview will have whetted your appetite! I guarantee that the last book, The Red Winter, will leave you wanting more, and we’re lucky to have Impyrium now, and all the books that will follow to look forward to! Thanks so much for this wonderful insight on Henry Neff’s Tapestry. For me, I just can’t get enough of Max McDaniels, David Menlo and co. The fact that you can get a bit acquainted with a lore that most people haven’t heard of while having thw time of your life with a great plot and cast of characters is most certainly a plus. Personally, I couldn’t resist buying Irish Folk and Fairytales Omnibus when I saw it on the bookstore’s shelf and that’s absolutely thanks to Henry H. Neff.